Mitsubishi GL25 - 2.5 kw cooling hi wall - only $2090 installed! A very popular cooling option for bedrooms! The GL25 High Wall Air Conditioner features Next Generation High Efficiency Compressor Technology, developed and engineered specifically to use less power than ever before. Exceptional energy efficient heating and cooling and unbeatable whisper quiet operation makes the GL25 ideal for small bedrooms. Mitsubishi GL35 - 3.5 kw cooling hi wall - only $2290 installed! The Mitsubishi GL35 Air Conditioner features Next Generation High Efficiency Compressor Technology, developed and engineered specifically to use less power than ever before. Exceptional energy efficient heating and cooling and unbeatable whisper quiet operation makes the GL35 ideal for small rooms. Room sizes stated are recommendations only – upon our review and measure of your room, we may recommend a different capacity heat pump. Bookings essential. additional costs may apply for anything other than standard back to back install. Maximum 3m of pipework including in this promotion. Not available for on roof installation. Outdoor unit must sit at ground level. Commercial or retail installations will attract additional fees. Please note: If applicable, there will be a $95 fee for removal and disposal of old Heat Pump Units payable direct to Heat Pumps NOW. Travel costs apply for areas more than 15km from Christchurch city centre, please enquire for details. 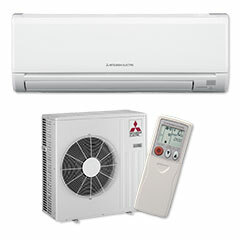 Choose from a wide range of Mitsubishi Wall Mounted Heat Pumps to suit all budgets and room types. Whether you are looking to heat a small bedroom or a large shared living space, Mitsubishi heat pumps have it covered. Mitsubishi Floor Console Heat Pumps heat from the ground up. The twin fan operation means that you can blow hot air downwards onto the floor and upwards into the room. Perfect for those who get cold feet, live in cold areas or where there is limited wall mounting space. With a Mitsubishi ducted heat pump system you can maintain a perfect temperature throughout your home. A ducted system is the ultimate heating solution. Usually mounted in the roof space, these whole home systems can be controlled by the touch of a button.